The Toyota RAV4 has long been a fan-favorite of customers and critics for being a dependable, safe vehicle with great performance and utility. Given this impressive reputation, it would have been understandable had Toyota had decided not to mess with success. Not one to rest on its laurels, Toyota went ahead with this redesign and ended up giving RAV4 enthusiasts in Knoxville, TN more of what they loved and more new features to remind them why they love this model so much. One of these upgrades was a rugged new exterior look, featuring a bigger wheelbase, flared fenders, and two-tone paint designs. Rusty Wallace Toyota, located at 5944 West Andrew Johnson Highway in Morristown, TN, is proud to have a wide selection of the 2019 Toyota RAV4 on its lot. Browse our new vehicle inventory and see which RAV4 trim level suits your needs. The RAV4 features a new 2.5-liter inline-four (I4) cylinder engine capable of generating 203 horsepower when paired with the Direct Shift eight-speed automatic transmission. Sevierville, TN drivers can look forward to smooth transitions between gears and efficiency leading to better fuel economy. This SUV also features three drive modes for drivers who like to switch things up a little. Sport mode, ECO mode, and Normal mode all provide a different driving experience. This vehicle’s multi-link rear suspension provides responsive, yet steady handling, by attempting to keep firm traction on the road. The standard Multi-terrain Select works with the available all-wheel drive to give drivers four modes to help improve traction, based on the type of terrain they are encountering. The four modes are mud/sand, rock/dirt, snow, and normal. Combined with the improved ground clearance, our Greeneville, TN customers are sure to enjoy their off-road time with their new RAV4. The 2019 Toyota RAV4 provides our Newport, TN customers with plenty of cargo room and innovative space for storage. When the second-row seats are folded down, this SUV gets 69.8 cubic feet of cargo room. RAV4 enthusiasts may be amazed by the smaller spots to find additional storage. There are plenty of small shelves, nooks, and pockets around the vehicle to provide a lot of utility for a vehicle of its size. Toyota has done a lot to provide drivers and their passengers a comfortable and entertaining experience. The available panoramic glass roof gives a great view of a night sky and allows natural light to flow through the cabin. The available SofTex®-trimmed seats and eight-way power-adjustable driver’s seat with memory are designed with the idea of making long trips relaxing. The available heated/ventilated front seats provide a comfortable experience and even the passengers have available heated seats in this SUV. The 2019 Toyota RAV4 now features Apple CarPlay™ compatibility. Customers can now use their compatible iPhones through the RAV4 Entune™ 3.0 system to do most of the stuff they would do with their phone like making calls, sending messages, and listening to music. Another new for 2019 tech feature is the first camera-based digital rearview mirror. The RAV4 has an available JBL® w/Clari-FI audio system. The system is 800 watts and has 11 speakers. Our finance team has an abundance of experience and can help you decide whether you would be best served by leasing this new SUV or going with a traditional auto loan purchase. 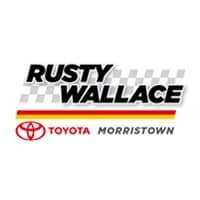 Rusty Wallace Toyota, in Morristown, TN, has many new lease specials, financing promotions, and incentives on new Toyota vehicles. Contact us, or make your way to the dealership, and find out if any of these apply to you. Don’t hesitate because many of these specials, promotions, and incentives expire monthly and we wouldn’t want you to miss out on a great deal on a 2019 Toyota RAV4.